Dear Colleagues, If you have any professional or personal development courses that begin between September 1 – December 31, you can apply for funding through the MRSA EDT Committee. Applications are submitted via the EDT database. The fall application period closes on November 15. 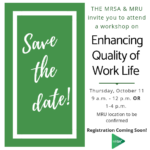 Further to a Memorandum of Agreement in the Collective Agreement, MRSA and MRU will be hosting a professional development workshop on Enhancing the Quality of Work Life. Staff will have two opportunities to attend: from 9 a.m. to noon, or from 1 to 4 p.m.